Burton and Eagle Creek campgrounds are operated by local community groups. While the Park Act fees have been removed from the BC Parks fee schedule for these sites, user fees are still being collected by the operator. BC Parks camping fees are still being collected for the Shelter Bay site. 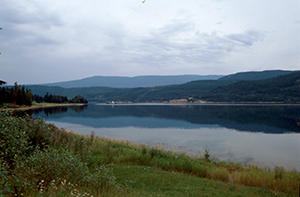 Shelter Bay Site is one of four small sites in Arrow Lake. Park management of the other three sites (Burton, Eagle Creek and Fauqier) is by local community groups. Upper Arrow and Lower Arrow Lakes are a widening of the Columbia River and lie between the imposing Selkirk Mountains on the east and the Monashee Mountains on the west. Narrow strips of beachland varying in width from a few metres to several thousand metres are interspersed with rocky headlands and steep cliffs along both shorelines of the lakes. These give way to heavily forested mountain sides that rise rapidly to elevations averaging 2,500 metres on the west and 2,700 metres on the east. Water-oriented activities dominate the scene. Angling for kokanee, Dolly Varden and rainbow trout is a popular pastime. Highway 6 traffic crosses the lake by ferry between Fauqier and Needles and Highway 23 traffic by ferry between Galena Bay and Shelter Bay where the park is located. Here is ferry information. Approved Purpose Statement and Zoning Plan for Arrow Lakes Provincial Park – Shelter Bay Site [PDF 234.43KB]. Horse and/or horseback riding opportunities in this park. The park has a picturesque swimming beach along the shores of Upper Arrow Lake. The water temperature is cool and refreshing. There are no lifeguards on duty at provincial parks. The park has a concrete boat launch with a breakwater and has a large, gravel vehicle/boat trailer parking area. Boat trailers can be parked overnight in this lot. Overnight, boats are sometimes left in the water in a partially sheltered lagoon due to high water in July and August. There is a cold water tap in the camping area. Taps are shut off during the off-season.